Teens Who Vape Get Hooked On The Nicotine, Users Say, And Then Reach For Tobacco : Shots - Health News Public health officials worry vaping is an emerging disaster that could reverse years of decline in smoking by young people. What's the latest evidence that e-cigarettes are a gateway to tobacco? The debate over the health risks of Juul, vaping and e-cigarettes is now spilling into the public square. In one of the most restrictive measures nationwide, San Francisco voters in June upheld by a large majority — nearly 70 percent — a ban on the sale of flavored vaping products, as well as conventional menthol cigarettes. Even before that, federal agencies had launched a wave of crackdowns against retailers that sell e-cigarettes, including the popular Juul brand, to minors. Public health advocates and officials worry these sales could be an emerging disaster, reversing years of declines in smoking. E-cigarettes are tiny — they look like a pen or flash drive. When someone vapes, there's no fire, ash or smoky odor. Instead, the devices heat up and vaporize a liquid or solid. And vaping appears to have taken off among young people. "Believe it," says 21-year-old Julien Lavandier. "It's a habit for me, you know — all the time when I set down my schoolwork to do homework, take a rip of the Juul. When I get in my car, take a rip of the Juul." 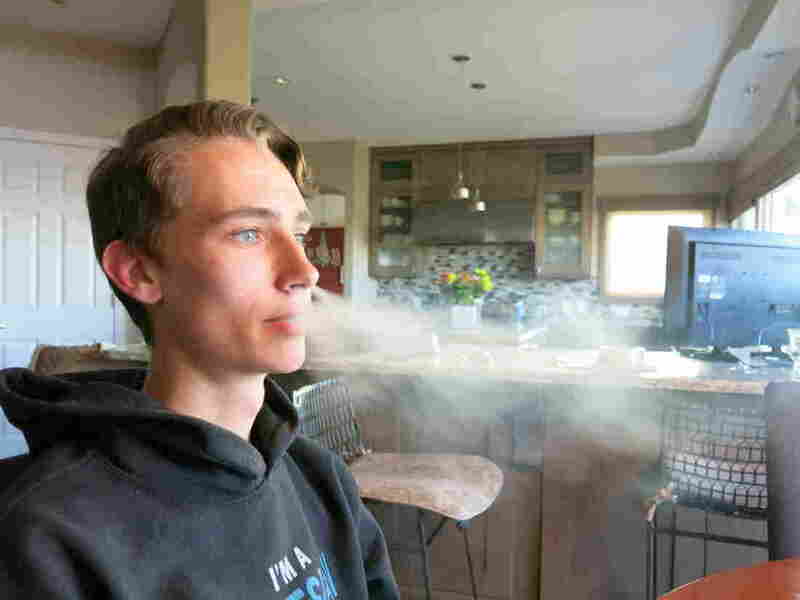 Lavandier, now a student at Colorado State University, started vaping when he was a sophomore in high school. He says he'd go to parties where it was common to smoke an e-cigarette. "At first," he says,"it was a lot of, you know, chasing flavors, or doing smoke tricks and that was really what impressed me. I thought, you know, this is cool, this looks like something fun." He says students at his high school vaped in class without teachers knowing. He estimates a quarter of his classmates were habitual e-cigarette users. Lavandier started vaping regularly and later began smoking traditional cigarettes. When Juul arrived on the market, he took that up too, and found it habit-forming. He liked it more than marijuana or alcohol. "It's impossible to let go once you started using," Lavandier says. "I'll tell you — after even an hour and a half or two, I am chomping at the bit to find my Juul." Stores aren't supposed to sell e-cigarettes to minors, but Lavandier says he has been buying them for years and was never once carded. In April, the FDA asked the firm behind Juul for documents to see if it's intentionally marketing to underage teens. Julien Lavandier holds his Juul up for inspection. The tiny handheld device, typically around the size of a USB flashdrive, simulates the experience of tobacco smoking. The company has online testimonials and has built an online community around their product. In one video, a woman in her 30s named Lauren says she's constantly "encouraging people to use this, and not smoke your cigarettes." Representatives from Juul Labs declined repeated requests for an interview. In a written statement, the company said its product offers a "true alternative to adult smokers, not anyone else, not minors." Other companies that make e-liquids also say their products are not for minors. The companies do offer a wide range of sweet flavors, however, like cotton candy, caramel, cherry, cookies and milk and crème brûlée. "If it tastes good and a kid might get their hands on it — that's not our goal," says Jameson Rodgers, the VP of business development for NEwhere Inc, a California-based maker of e-cigarette and vaping products. "Also," Rodgers says, "I feel like some of the responsibility has to fall on some of the parents of any kid that's deciding to walk into an adult store, whether that's a liquor or a tobacco store." The head of Colorado's health department, Dr. Larry Wolk, finds it hard to believe industry claims that it isn't marketing to kids. "I have to call BS on that," he says, "because the flavors are cotton candy, Frutti Tutti and they have cartoon characters on their labels and you can mix flavors and strengths. It's really appealing to kids, whether or not they are intentionally marketing to kids." Wolk also points to research that suggests youth vaping leads to traditional smoking. A January report from the National Academy of Sciences, Engineering and Medicine makes that conclusion. "Among youth — who use e-cigarettes at higher rates than adults do — there is substantial evidence that e-cigarette use increases the risk of transitioning to smoking conventional cigarettes," the report finds. Dr. Deborah Liptzin, a pediatric pulmonologist at Children's Hospital Colorado, sees e-cigarettes as the "new way to get kids addicted to nicotine." She worries there's been little research on health risks. One of the benefits of e-cigarettes, according to the industry, is that the devices can help people quit their use of tobacco products. When it comes to that habit, the advice from Ray Story, the founder and CEO of the Tobacco Vapor Electronic Cigarette Association is "don't start at all." "But if you're going to smoke or do e-cigarettes, then certainly take an e-cigarette because it's vastly less harmful," Story says,"if you consider both of them contain nicotine, and both of them are addictive. It's vastly less harmful than conventional tobacco." 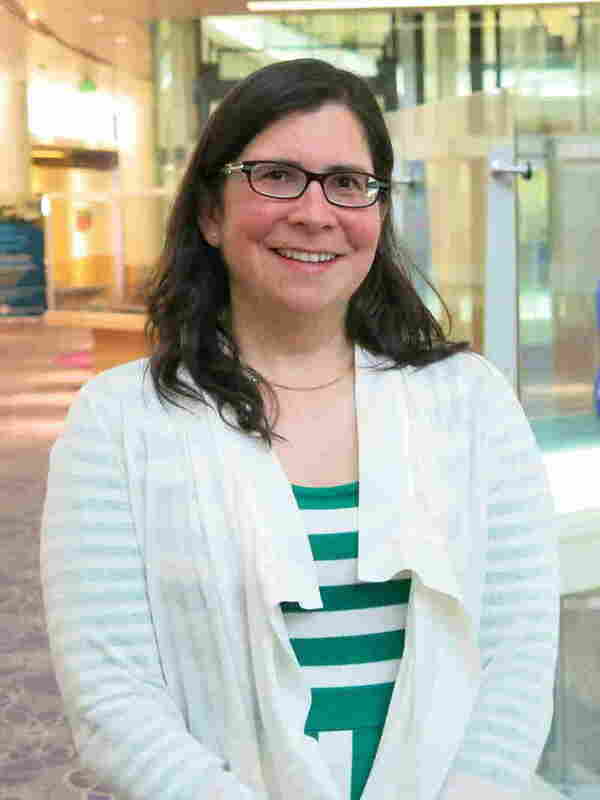 Dr. Deborah Liptzin, a pediatric pulmonologist at Children's Hospital Colorado, sees the evidence differently. E-cigarettes, she says, have become "the new way to get kids addicted to nicotine." There's been scant e-cigarette research, she notes, including on Juul and the ingredients in the e-liquids used in the devices. "They specifically use nicotine salts," Liptzin says. "We have no research that I could find on nicotine salts that are inhaled, because it's so new." Jen Bolcoa is a health education coordinator with Jefferson County Public Schools. Data from the 2015 Healthy Kids Colorado Survey found nearly half of Colorado high schoolers reported that they've vaped. One in four said they had used an e-cigarette in the last month. That's three times the rate of traditional cigarettes, and has raised concerns among public health officials. 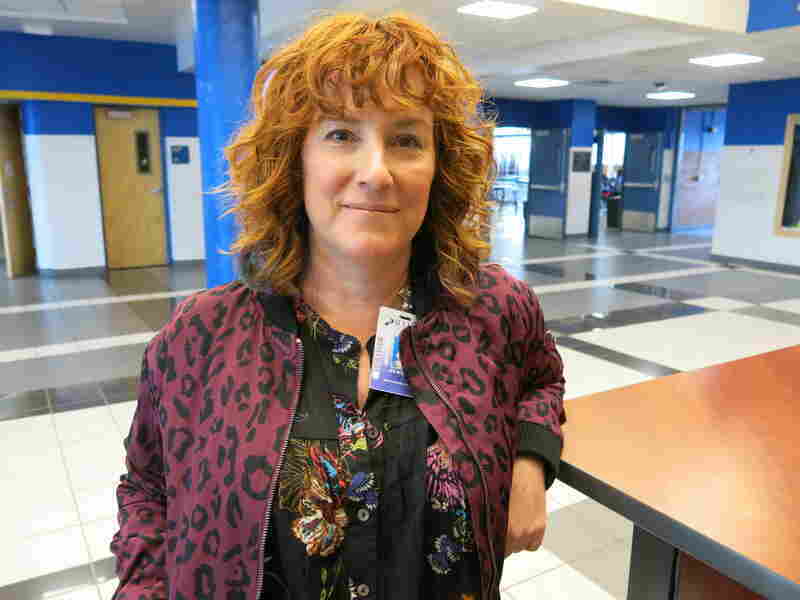 "The Juul has definitely been a game changer," says Jen Bolcoa, a health education coordinator with Jefferson County Public Schools. The tiny pod of e-liquid in a Juul has the equivalent nicotine of approximately 20 cigarettes — an entire pack — according to the company's website. Most educators, parents and students "don't realize how much nicotine is in there, or that there's even any nicotine," she says. "That's what the research tells us." Bolcoa works with students as part of the Breathe Easy team, a club at high schools backed by Jefferson County's Tobacco-Free Youth program, to educate students, parents and administrators about the larger risks of tobacco use and Juuls. An educational video the team posted on Facebook tells viewers that "Juuls and other e-products are disguised to look like pens, flash drives." 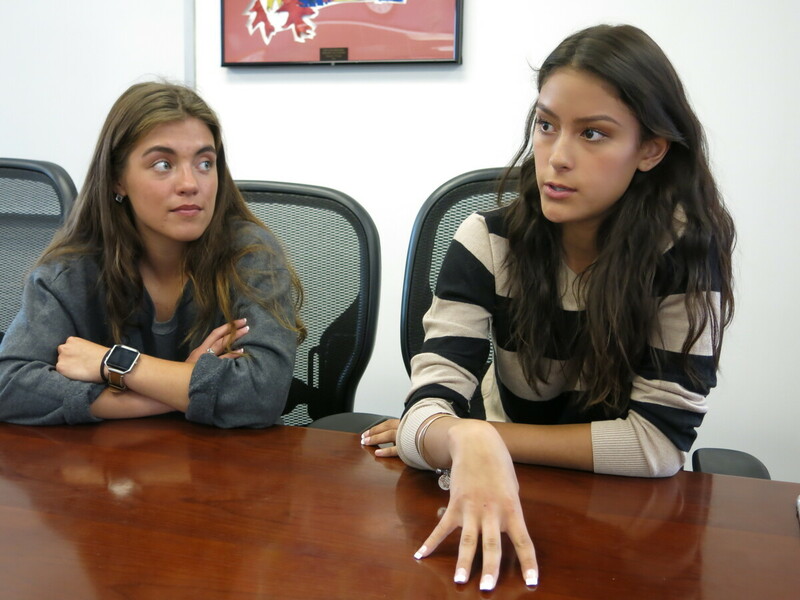 Wheat Ridge High School seniors Gabriella Cordova, right, and Teresa Kenison, are members of the Breathe Easy team, which educates students and adults in their Denver area school about tobacco and e-cigarette use. But their video competes with others posted by teens on social media sites. On YouTube, there's a video called the Juul Challenge. Two guys sit in the smoke-filled front seat of a car, competing, pulling on Juuls. "Cheers guys. Let's see how many hits I can do? You got five," one of video performers says. "How many hits can you do? Write in the comments." That video had more than 230,000 views, and 380 comments in seven weeks. Teresa Kenison, a volunteer on the Breathe Easy team, says social media helps drive the vaping trend. She's seen frequent use of the devices in classrooms, bathrooms, and parking lots. 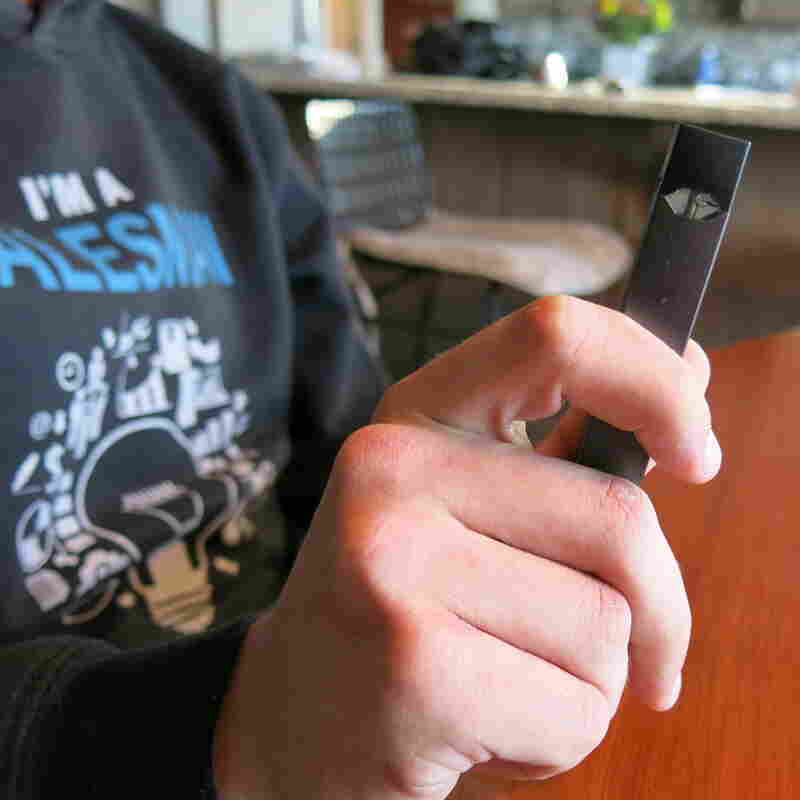 All sorts of students are using e-cigarettes and Juuls, from those in AP classes to athletes. "It's really everywhere," she says. "Students are getting hooked." She's even noticed older kids making runs to the convenience store for younger ones. Lavandier can attest to the power of e-cigarettes as a gateway to tobacco use. The college student says he's now hooked on both cigarettes and e-cigarettes. He has tried to quit, but says he now can't go three days without using a Juul. On a typical day, he'll take upwards of 300 puffs. "So my biggest concern," he says, "is, you know, right now I'm puffing, puffing, happy, worry-free, and then in 20 years I'll have to explain to my kids why I've developed popcorn lung — or some new form of lung cancer," Lavandier says. "Because I didn't know what the risks were of e-cigarettes. It terrifies me." This story is part of NPR's reporting partnership with Colorado Public Radio and Kaiser Health News.